Chinese paramilitary police march during a flag raising ceremony in Lhasa in Western China’s Tibet’s Autonomous Region. Image: AP. The Gonggar airport in Lhasa, Tibet Autonomous Region (TAR), is located just 1,350 kilometres from India’s capital New Delhi. Reports suggest China is turning it into a military airbase. 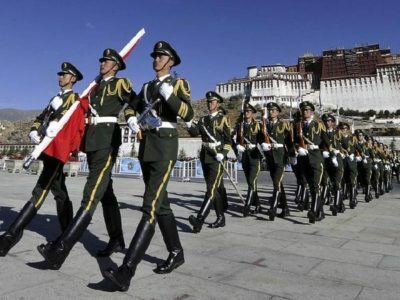 New Delhi: The security establishment in New Delhi is increasingly getting concerned amid reports that China is allegedly turning the airport in Tibet’s capital Lhasa into a military airbase. The Gonggar airport in Lhasa, Tibet Autonomous Region (TAR), is meant to be a civilian airport aimed at boosting regional connectivity. However, it has been learned that Beijing is building underground bomb-proof shelters at the airport to the station and secure fighter jets there. This was reported in the Hindustan Times on Wednesday – the newspaper cited three officials familiar with the matter as commenting on New Delhi’s concerns. It has been reported that a ‘taxi track’ has been built that leads from the runway to underground bomb-proof hangers. The hangers have been constructed deep inside the mountains nearby. The report further said the hangars can house around 36 fighter jets or three squadrons. 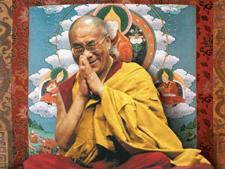 What makes China’s actions a concern for India is the fact that the Lhasa airport is only 1,350 km from New Delhi. The news has come in the wake of improving ties between the two neighbours, following last year’s unprecedented Doklam crisis. In fact, PM Narendra Modi travelled to China’s Wuhan to take part in an informal summit with President Xi Jinping. The two leaders at the summit agreed to improve bilateral relations. One of the officials the newspaper spoke to said blast- or bomb-proof hangers are needed for fighter jets when a country prepares for possible hostilities. Such aircraft housed in the open at airports are vulnerable to damage and destruction during hostilities. China’s Air Force has already built similar facilities along the border with Russia. It may be noted here that India too has been upgrading its airstrips along the border or Line of Actual Control (LAC) with China. These temporary airstrips are called Advanced Landing Grounds (ALG) and most of these were built in Arunachal Pradesh during World War II.